Upon entering ‘Jim’s Horn House’, one is overcome by the magnitude of his collection. From the door handle to the back wall, from the bases of the tables to the rafters, sheds, mounts, and recovered skulls spanning six decades of searching and beyond fill his carefully organized room. Thoughts of what appears to be chaos at first are quickly dispelled as the tour begins. Atop the center table are large deer sheds and ones with many tines. Stacked beneath the table, lining the walkway, are piles of “average” sheds – antlers from deer most hunters would be elated to harvest. Every year, deer and elk shed their antlers as winter turns to spring, regrowing their antlers from spring through the summer. The antlers harden and shed their velvet cloak as they approach the fall breeding season. Often times, a deer or an elk will shed in the same area, leaving proof they made it through another winter – but, it’s only proof if you know where to look. As a lifelong resident of Three Forks, Montana, he’s seen his small town grow, and witnessed first hand the changes taking place on the landscape with his own eyes. He’s seen herds of elk and mule deer come and go, watched as whitetails arrived, and noted how patterns of various species changed over time. Phillips became consumed with hunting for antlers around age 10. “My parents had a small trailer in the Gallatin Canyon. There was no TV, so I’d walk the river corridor. On my first walk, I found my first elk shed. I found another the following day and have been hooked ever since. I can’t explain it, I just love it.” said Phillips. Phillips loves all sheds, but has a particular fondness for the peculiar ones. Phillips believes the odd ones inspire the finder of the shed to ask more questions. ‘What caused this trait? Can it be traced across different deer or elk in the area? Was he injured? Broken pedicle?’ Sometimes, seeking the answers to these questions is the best part of the hunt. His primary collection has grown to 16,171 sheds, enough to fill a 1,920 sq ft. floor-to-ceiling addition. All of his collecting was done on foot with no dogs, horses, four wheelers, or bikes. 80-85% of Jim’s sheds are from Montana – within a 100 mile radius of Three Forks. He’s picked sheds in other states, has traded other collectors for unique antlers, but has NEVER purchased a shed. “I love finding them too much. I’m happy to trade if a buddy has something interesting, but, I prefer to earn my sheds. It takes work. I sold some antlers in the late 80's and early 90's to help put three daughters through college, but if I had to do it all over again I would have done things differently. You just can't replace what you have sold,” he recalls. 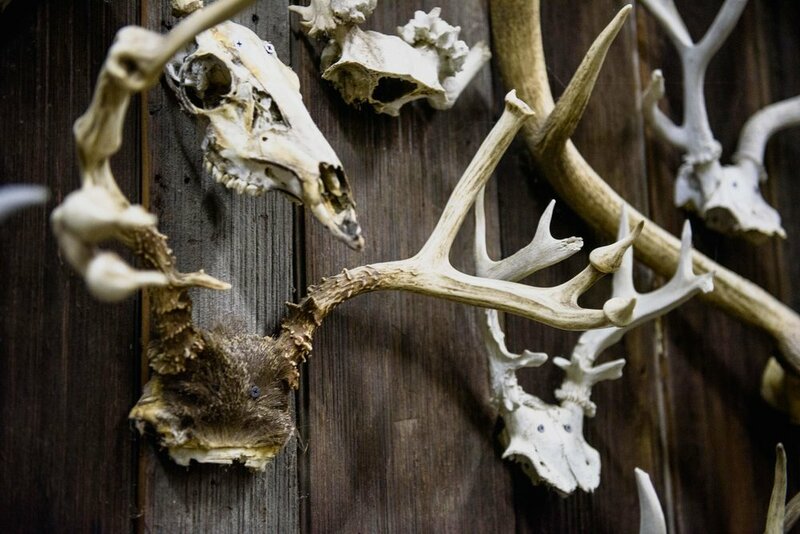 Around the Horn House, there are bull elk that had an injury while still in velvet, a deer antler with a bullet hole through the main beam, antlers wrapped in a gnarly tangle of wire, bison skulls, and taxidermy that dates back to the 1930s. His ability to recount the story of his sheds is remarkable. Looking at a particular bison skull, there was a clear delineation of color running across it’s cheek. When Philips found it, he said only an inch or two was exposed. He almost walked past it, but got a feeling it could be a bone of some sort. He believes the skull is from pre-1890. When asked how he knew the date, he was quick to answer. “After 1890, there weren’t any wild bison around!” he smiled. Near the end of the tour, Jim pulled out one of two sheds he’s ever modified. “You see that? That’s a peticle. This is a shed!” he laughs. Attached to his keychain is a two-inch nub that more resembles a gift shop attempt at the tooth of a large cat than a bone that was shed from a deer.